It’s been nearly 10 years since the finale of Avatar: The Last Airbender aired on television, and since then, no other show has quite scratched the same itch. Even though it was designed as a children’s cartoon, Avatar’s mix of complex world-building and charming, multifaceted characters has been nearly unparalleled. But Netflix might be about to change that. The Dragon Prince, which launched on Netflix on Friday, September 14th, is an original series from Wonderstorm, a new TV company helmed by gaming veterans who have worked on large franchises such as League of Legends and Uncharted. 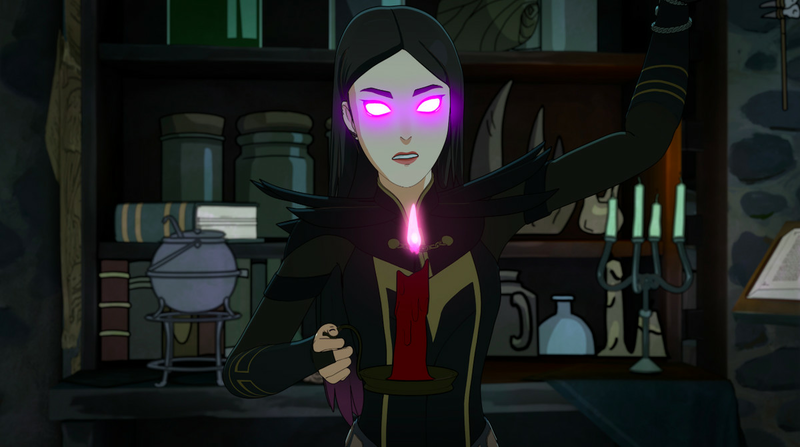 Co-written by The Last Airbender head writer Aaron Ehasz, this computer-animated show has an undeniable Avatar influence: The Dragon Prince is divided into “books” that correspond with magic elements, just like Avatar. There’s a lot of action, just like in Avatar. And bizarre magical animals abound, just like in Avatar. One of the main characters is voiced by Jack De Sena, who voices Avatar’s Sokka fame, so every line out of his mouth is a reminder of his previous show. Most importantly, the new show’s myth-building is masterful. The Dragon Prince offers viewers a rich and suggestive world that’s teeming with possibilities about what might be happening beyond the frame. Wonderstorm takes us to the world of Xadia where nature has created six prime sources of magic: the sun, the moon, the stars, the earth, the sky, and the ocean. A thousand years ago, humans created a new element, dark magic, which feeds off the essence of magical creatures. Dark magic is powerful, but its parasitic nature horrified the elves and dragons of the land who pushed humans into the west of the continent. To defend the border between the magical lands and the human kingdom, a mighty dragon king once stood watch, but humans eventually killed it and its dragon heir. 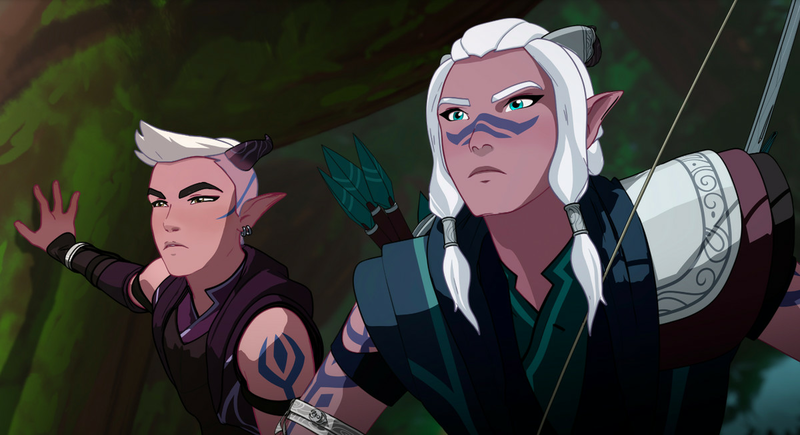 This is where The Dragon Prince begins: tensions between the factions are high, and the world is on the precipice of an all-out war. All this backstory is explained within the first few minutes of the show so viewers understand the stakes, but, more importantly, to establish the myth. The story revealed in the show’s opening is Xadian history as the average citizen knows it, but as The Dragon Prince progresses, it emerges that — as with the written versus actual histories of most nations — there’s a gap between how the story is officially told and what actually happened. It’s fitting, then, that the main cast is composed of kids who don’t yet fully grasp the politics that torment their parents. The audience starts out as naïve as the unreliable protagonists, which means that when they’re surprised, we’re surprised, too. The constant upending of expectation is one of The Dragon Prince’s biggest delights. The human realm is led by King Harrow, a widowed monarch with two sons, the jovial Callum and jelly-loving Ezran. Even in such a small family unit, there’s friction. We don’t know what happened to their mother, but without her, the boys don’t know how to regard one another. When the elves plan Harrow’s assassination, the drama isn’t fueled by the epic shaping of an as-yet-unknown kingdom and its future, but rather how this set of circumstances influences the characters’ interpersonal relationships. This web of relationships permeates the show’s universe, with related characters having differing or conflicting motivations. The plight of the elves, for example, is filtered through Reyla, a gifted young woman who belongs to a coven of assassins. The problem is that Reyla, unlike her family, is burdened with a conscience. Reyla doesn’t understand why the elves are fighting the humans, many of whom haven’t personally done anything against the elves. So when she meets Callum and Ezran, they quickly become allies, against their parents’ wishes. The adults in the room are too married to their existing beliefs to stray from the course, even if it means uncertain death. It’s up to the kids to go out and set things right — though, as it quickly becomes clear, none of them have any idea what they’re in for. That’s a good thing: Avatar’s brand of humor is alive and thriving here, adding some much-needed levity to otherwise dire circumstances. In Avatar, characters joke about things like tragic love stories, and characters in The Dragon Prince evoke laughs even when it seems like they’re about to die. More impressively, the show humanizes characters that would otherwise come across as merely villains. One of Avatar’s greatest strengths is its ability to make “evil” characters relatable. It often devotes time to fleshing out villains’ backstories, empathetically tracing their paths to extreme ideologies. The Dragon Prince similarly takes care to never paint its characters with a single brush: King Harrow, arguably a hero, is quick to admit he’s committed atrocities. Dark magicians, meanwhile, might be killing wondrous creatures to fuel their powers, but some are ditzy enough to narrowly miss walking into trees. Nobody is just one thing, which makes it easy to feel conflicted about the characters and their goals. Of The Dragon Prince’s many qualities, its most distinctive is undoubtedly its animation, which appears to generate 3D-looking characters on a 2D plane. In motion, it can be strange to witness: movement appears choppy, as if every third frame has been cut from the reel. As the creators tell it, this is an intentional style, a digital technique that mimics the aesthetics of stop-motion and traditional hand-drawn cartoons in order to create more dynamic sequences. At times, the animation can be distracting; judging by reactions to the trailer earlier this year, it’s clear the approach will be divisive among fans. But during action scenes, it looks fantastic. With fewer frames to absorb, your eyes are able to follow every blow and pirouette. Combined with beautifully hand-painted backgrounds, every hectic scene is still smooth to watch. Only the first three episodes of The Dragon Prince were available to press in advance, and the story leaves off just as the true adventure is about to begin. Much is riding on the shoulders of the three unlikely young heroes, which may be enough to excite viewers, but the smaller details are just as intriguing. They hint at a larger world lush with secrets, as was the case with Avatar. What of the Dragon Queen that survived the deceased Dragon King? What do all the elaborate weapons, tattoos, and customs suggest about elven society? If a full moon gives elves extra powers, in what ways can the other elements be exploited, and who can do so? What other fantastical creatures exist in this world? If dark magic consumes rare creatures, are the people who use it all innately wicked? The show is rife with smaller elements, and the details seem designed to raise complicated questions for people to obsess over and elaborate on. Like Avatar: The Last Airbender, The Dragon Prince seems designed to not only build an elaborate world, but to build an elaborate fandom. The first season of The Dragon Prince is now available on Netflix.